Why do bars close to each other join together in the calculation? 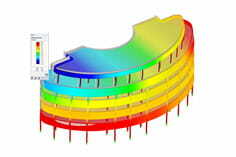 The program interprets the entered model for the actual calculation in a FE mesh. This network depends on the shape parameters in the Calculation / FE mesh setting dialog. In order to correct any modeling inaccuracies, there is a parameter "Epsilon" in the FE mesh settings. In a figurative sense, this parameter controls the maximum distance between the FE nodes. In the existing example, if the distance between the elements / nodes is smaller than the epsilon parameter, the FE nodes are grouped together. This summary finally gives the mentioned "merging" of the bars in the calculation. You can bypass the join and simulate the bars independently by setting the epsilon parameter smaller than the available distance.